PUDUKKOTTAI/ NEW DELHI: Chief Minister of Northern province of Sri Lanka, C V Wigneswaran, visited Premananda Ashram in Fatima Nagar, about 20 km from Tiruchy on Friday night. 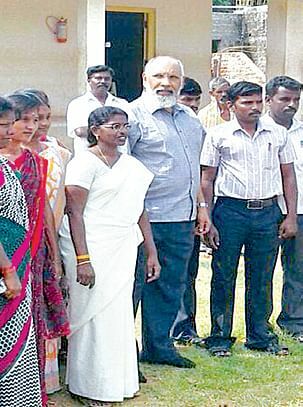 This is Wigneswaran’s first visit to India after taking oath as the Chief Minister. A huge posse of policemen were deployed in and around the ashram. The bomb squad and sniffer dogs too were pressed into service. Sources said, after reaching Chennai on Friday afternoon, Wigneswaran went to Premananda Ashram where he was given a grand welcome by the members of the ashram trust. He stayed in a cottage at the ashram and offered early morning prayers at Siva temple in the ashram premises, where the mortal of Premananda was buried. After a discussion with the functionaries of the Ashram Trust over the functioning of the ashram, Wigneswaran planted a sapling in the premises of the school, run by the Trust. Later, around 10.30 am on Saturday, he left for Chennai by road. According to ashram authorities, Wigneswaran visits the ashram every year and is a staunch devotee of Premananda. Meanwhile, sources told Express that there are no plans for Wigneswaran to travel to Delhi - since he has not been able to get an appointment with either Prime Minister Narendra Modi or External Affairs Minister Sushma Swaraj. It would have been futile for Wigneswaran to visit Delhi, if he could not meet with either of them. Of course, India always delicately balances its moves related to Lanka, which was also perhaps was one of the reasons why Wigneswaran could not get time from Delhi. Earlier in August, a TNA delegation had met Modi.